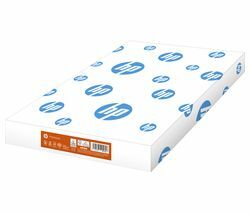 For top quality output from HP printers as well as copiers and fax machines, HP paper is designed to give you professional results. At home or at the office, for high-volume printing or glossy photos, HP is an award-winning brand that won't let you down. HP printer papers are engineered to optimise the performance of HP printers, inks and toners for the print projects you do every day. Its multipurpose paper gives crisp results on strong and durable paper and is designed for offices with high-volume printing needs. Heavier, thicker and whiter than ordinary multi-use paper, it's made with ColorLok technology for a faster drying time, a smear-free finish, deeper, bold blacks and crisp, vibrant colours. Compatible with all laser and inkjet printers, copiers and fax machines, it provides great printing results across the board. For stunning photographs, HP's easy-to-use photo papers resist fading, dry instantly and are smudge proof. Their thickness and weight provide a superior look and feel, and with a variety of sizes to choose from, it's easy to print vivid, lab-quality photos at home. For more photo printing fun, HP ZINK Photo Paper is specially designed for the compact HP Sprocket Printer. Producing a glossy finish that's water and tear-resistant, this paper's sticky back means you can mount your snaps in a collage or on your wall. With HP Social Media Snapshots Photo Paper, you can print and share pictures from Facebook, Twitter, Instagram and more. Just download the HP Social Media Snapshots app, sync your tablet or smartphone with a compatible wireless printer and create instant physical copies of your favourite pics from your social accounts. You can even personalise your photos before you print them via the app, adding funny captions and messages. This HP paper also features a peel-and-stick back so you can stick your photos up anywhere and decorate your space.